Wondering how James River Advisors can help you achieve your goals? Get a complimentary financial review to find out if we’re right for you. James River Advisors is a Virginia-based financial planning and investment management firm serving individual investors and families. We offer a unique, low-cost fee structure to address all of your financial needs, including investments, financial planning, tax planning and preparation, trust and estate planning and insurance. Securities offered through registered representatives of Colorado Financial Service Corporation, Member FINRA & SIPC. James River Advisors and Colorado Financial Service Corporation are separate entities. OSJ Address: 304 Inverness Way S, Ste 355, Centennial, Colorado. This advisor or firm received a 5 Star quality rating from Paladin’s research department. 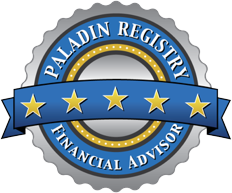 Paladin analysts use a proprietary algorithm to rate the quality of financial advisor and firm credentials, ethics, business practices, and services. Copyright © 2019. James River Advisors. All rights reserved.